Other than that, we're 29 and traveling the world! On our last morning in India we were up early and had a great breakfast from room service and were off to the airport for our flight to Jordan. We arrived early especially since it was an international flight and because of all of the tight security at Indian airports. There were many last minute check-ins from the locals who never think they need to arrive early and therefore are always late. We arrived early only to find that we had arrived too early with nothing to do. The Cochin airport security was not as strict and there was nothing to occupy our time. Our flight had a lay-over in Dubai that was supposed to be only 2 hours, but we had a 2.5 hour delay in our flight. We tried to get into the airport lounge (fail) and so spent some time browsing all of the duty free shops instead. We arrived in Amman and were greeted by our driver Hamza and a company rep. From the start, we knew that the tour in Jordan was going to be more relaxed than the tour in India. For starters our vehicle was not a brand new SUV driven by a man in a formal uniform. Hamza was driving an early 2000’s Chevy sedan that smelled of smoke and Hamza was in jeans and a T-shirt. We checked into the hotel and were excited to continue the last leg of our trip in 5 star luxury. 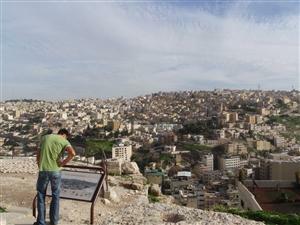 The next morning we toured Amman & the countryside. Our first stop was Ajloun, an Islamic military castle that was used by the Islamic armies of Saladin to protect the region against the crusaders. Six meters of the upper level of the castle was destroyed by an Earthquake in the middle of the 700’s AD. The castle is on a peak of a mountain range overlooking the entire region. We didn’t have a guide at Ajloun, so we had to make up stories to tell each other about the purpose of each room; it sure was an interesting castle!! 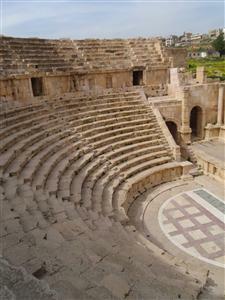 Next, we went to Jerash, Pompeii of the East. We had an excellent and very distinguished guide here. We entered the ancient city through the monumental South Gate and spent nearly 2 hours wandering around this ancient Roman city. 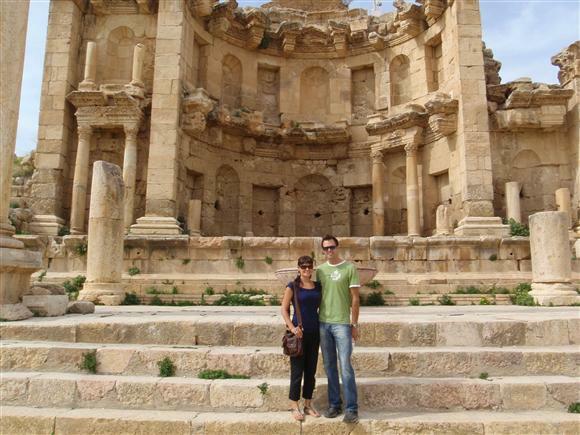 We started in the Oval Plaza, which is still surrounded by colonnades and then strolled along Jerash' main road the Cardo and passed by the remains of the Nymphaeum (an old water fountain fed by gravity). We also saw both of the two Roman theatres within the city walls. The acoustics in the main theater were amazing! Standing in the middle of the theater you can hear your voice amplified, even scuffling your feet can be heard throughout the theater. After Jerash, Hamza took us for a traditional Jordanian feast. 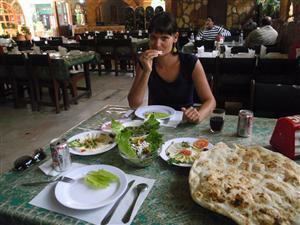 We had tabbula salad made of parsley and tomatoes, vegetable salad, GIANT freshly baked pita bread, lamb/chicken and beef scewers and lots of yogurt with garlic and dill. On the city tour we visited the Citadel, which are the ruins of another Roman city, and another larger 6000 seat Roman Theatre. Hamza had intended to show us a few more sites but we had already spent 9 hours visiting sites and were tired. Before we headed back to the hotel we stopped briefly at the King Hussein mosque, just to snap a few pictures from the car. About 3 minutes after we left the mosque, Hamza was pulled over by the secret police. Someone at the mosque had reported our activity as suspicious and the police were hot on our trail. After a quick interrogation with Hamza and a cursory inspection of our camera we were set free. It was a little unnerving to see how quickly the secret police responded to the call. The hotel had a gym so we enjoyed a quick work out and took full advantage of their wonderful mint-infused steam sauna. The next day we were waiting for Hamza….again (he was late practically every day to pick us up) for our drive to Petra. Along the way we stopped at the small town of Madaba, famous for a unique mosaic map of the Holy Land, which is in Saint Geroge’s church floor. Then we visited Mount Nebo, which is supposedly where Moses looked over the Holy Land and the Dead Sea. This is (supposedly) where Moses was seen for the last time, and is considered to be his burial place. From the top of the mountain on a clear day, you can see Jerusalem, Jericho, Bethlehem and the Dead Sea. There was a slight wind and blowing sand, which partially obscured our views. From Mount Nebo, we drove to the Dead Sea! The Dead Sea lies on the western border of Jordan (Israel is on the other side) and it is the lowest spot on earth at 400 meters below sea level. The water is super-saturated with salt and other minerals. There is so much salt in the water, that the ‘sand’ along the shore is actually mostly salt crystals. When you get in the water, the change in temperature from your skin causes a thermal gradient and change of concentration in the salt. This creates a magical looking swirling of the water, just like heat waves on the highway. 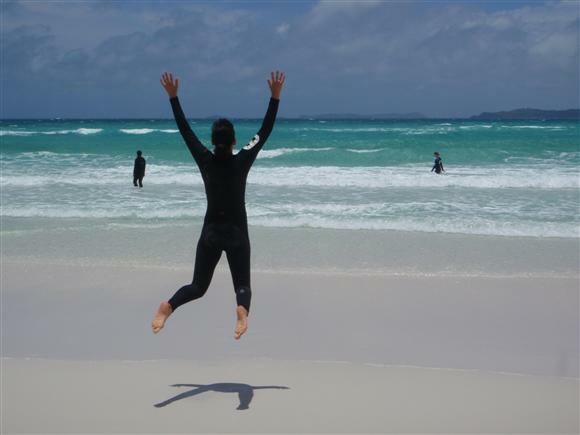 Due to the high salt content you become extraordinarily buoyant when you are in the water. You have to struggle to keep yourself under the water. You can float with ease on your stomach and on your back and it’s something that’s hard to describe in words. After our cold dip in the sea we were back on the road to our hotel in Hamza’s hometown of Petra, but not before another Bryan Colvin special. Hamza decided that he would take a shortcut through the back-roads. This shortcut took us through the mountains instead of along the very new and comfortable highway around the mountains. His shortcut was a one-lane road with sheer cliffs over 800 meters high… without any guardrails. The twists and the rolling road made it hard to see which way the road was turning and if there was any oncoming traffic or if the road continued at all. We survived the two hour ‘shortcut’ and live to tell about it. The next day we were excited to get to Thekkady, even despite the six hour drive to get there! The landscape changed from estuaries and rice paddies to rolling hills, coffee, tea, and spice plantations. 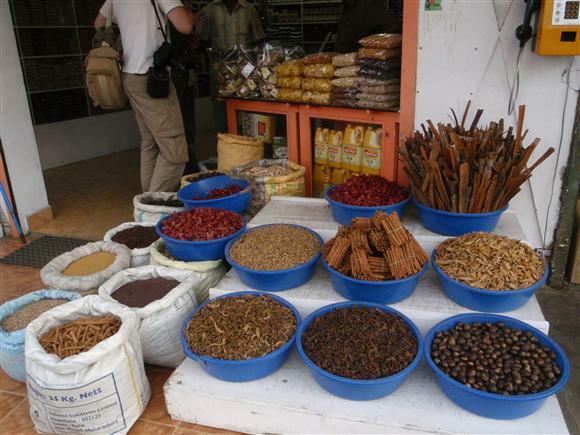 This region is known for growing just about any spice you can imagine and these spices are a defining element of human history. Europeans waged wars and traveled the world in search of routes with better access to these earthly riches. The area grows cardamom, cinnamon, pepper, coffee, tea, vanilla, star anise, cloves, nutmeg, ginger, chilies sandalwood even frankincense and mirh! Along with this you can find many kinds of nuts including almonds, cashews, hazelnuts and many types of fruit including pineapple, mangoes, oranges, bananas melons, and the list goes on! This was the first time we’ve seen the plants that produce a lot of these spices and nuts. For foodies like us this was a real treat. The road to Thekkady was lined with plantations and surprisingly …. mansions. The plantation owners are well off and built themselves near palace like homes, and why not? They are all brightly colored and gated. Along the way there were many stupas or small 3 story shrines to central figures of Christianity (Mary, Jesus, and various saints). These sights were amazing enough to take our minds off the ever present threat of a head on collision on the tiny narrow road (with no guard rails) that switch-backed up the mountain side with cars constantly dodging oncoming buses and rickshaws. On our first night we attended a local martial arts performance. The local guide told us that this style of martial arts is the foundation of all the martial arts from around the world, and that it was spread by the early Hindu and Buddhist monks who traveled to Asia. The individuals who practice this art are extremely disciplined, often devoting their life to the practice. It involves yoga like movements, training with a variety of weapons and then at the most advanced stages, training in hand-to-hand combat. Watching the performance reminded Chad of his years in Tai-kwon-do as a child (minus the swords and fire jumping). The next morning we slept through our 4:50 am wake-up call and were late for our pick up to head out to the Periyar wildlife sanctuary. This is one of the biggest wildlife reserves in India. It is home to Indian elephants, wild boars, lion-tailed monkeys, ibex, tigers, leopards and sloth bears. The sanctuary is also rich in bird life there are great hornbills, kites, darters, herons, egrets, owls and kingfishers. At least this is what all of the brochures say. Despite the long drive to get there in near freezing temperatures (seriously it wasn’t much warmer than 5 degrees and we were in shorts) at the break of dawn, we managed to see a total of two giant squirrels, two bison from a distance of over 500m and three packs of monkeys. Our guide told us that the reserve has around 1000 elephants and 44 tigers. However, they only see elephants 3-4 times a week and in 5 years he has only seen a tiger from a distance 5 times. We are not surprised after all it’s not a Zoo to watch animals but rather a place for them to live a decent life not hounded by humans. Surrounding the reserve are many small spice plantations and we spent an absorbing afternoon searching for pepper, cardamom, turmeric, cloves, nutmeg, ginger, cinnamon and betel. The day wasn’t a waste, the 9km hike through the jungle was a great reminder of how much we both really appreciate nature and exercise, both of which we’ve been lacking lately. After the reserve we went back to the hotel to relax and attempt to coax the kittens from their hole. There were two kittens and their momma who were living beside our door. After the two days of troubling the kittens they got us back! They woke us in the middle of the night playing with Chad’s socks that were hanging on a chair drying; but they were too cute to be mad at! 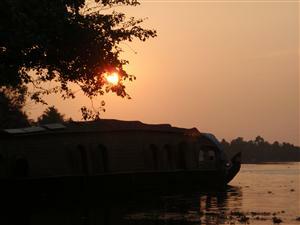 We were set for our last adventure in India, a houseboat trip down the Periyar river from Kumarokom to Alleppy. What we didn't read in the details of the trip itinerary was that we would have to drive almost 5 hours from Thekkady in order to reach the boat. Coming down the mountain through the switchbacks was an adventure in not trying to throw up in the car. When we finally pulled up to the dock to see a 40 foot boat waiting for us we knew we would have a great night. Turns out we’d be cruising in style …we had the whole boat to ourselves, including a staff of three. On the cruise down the backwaters we caught a glimpse of the rural life, farmers working in rice paddies and people taking their evening bath in the river in front of their house. The cook on the boat made us a traditional Kerela dinner, there was so much food! We enjoyed Valentine’s Day with a beautiful sunset and nothing but the sound of nature. This was our last night in India and it ended very sweetly. The next morning we were leaving India and starting our tour of Jordan. We stepped off the plane in Cochin into the humid tropical heat. The 10 days of relative cold in northern India somehow made us forget the past 4 months of 90-100% humidity and +30 degree temperatures we got used to. 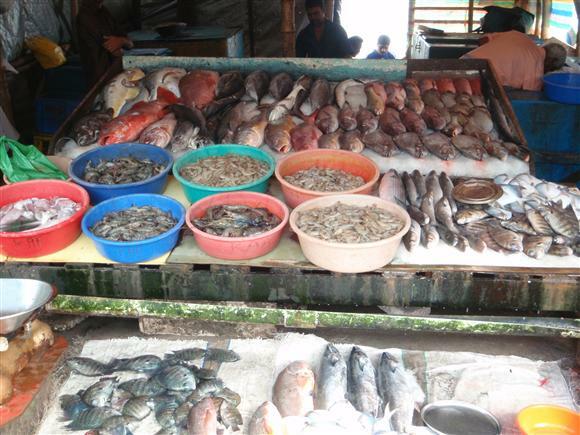 Cochin is a diverse port city, spreading over 5 islands and peninsulas. The main town, Ernakulam, is on the mainland. All the islands are connected by a ferryboat network and a few small bridges. 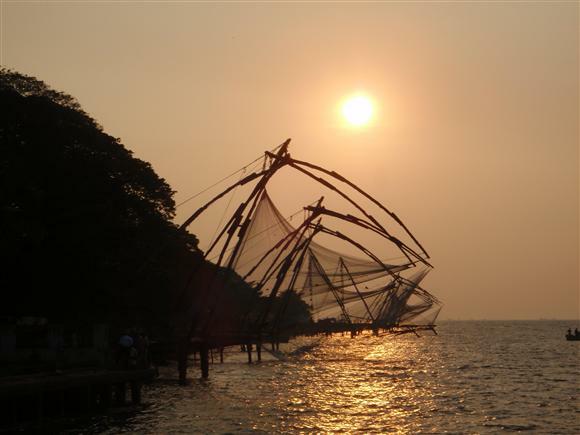 Around the headland of Fort Cochin, a group of cantilevered Chinese fishing nets dip into the sea at high tide to bring up fish. After checking into our hotel, the Casino (sadly there were no betting tables, seems a bit like false advertising) we headed out for an evening harbor cruise. It was a typical tourist boat with old plastic chairs and a fresh coat of paint. For some reason we had the boat to ourselves, it could probably have seated 20. The harbor is quite industrial and not overly scenic, but the sight of the fishing nets at sunset from the water was really amazing. The Chinese fishing nets were erected between AD 1350 and 1450 by Chinese merchants. The nets are made of teak wood and bamboo poles and work on the principle of balance; they are lowered to the bottom of the river/estuary and after some time lifted out, trapping the fish in the nets. The fishermen weren’t lucky when we were there and only caught a few small fish. We on the other hand were quite lucky and got to see 4 dolphins swimming a few meters from the boat! The next morning we were off on a tour of the old Cochin area. Our first stop was St. Francis Church, which has been in the hands of every nation that landed in Kerala. Originally there was a Syrian church here since the founding of Christianity when St. Thomas arrived in this region in 52 AD. It is also said by some of the conspiracy theorists that Jesus was not killed by crucifixion and instead that he settled in this area. The Portuguese came next and were surprised to see Christianity already having a strong hold on the local residents; they only had to try to convert them to Catholicism. Next came the Dutch, followed by the British who all renovated and added their touches to this Church. After the Church, we strolled around the old town and eventually came to visit Mattancherry Palace, which was a donation to the local king by the British after their troops had plundered a local Hindu temple. The ruling family is no longer in power and the palace and a few other artifacts are all that remain of the dynasty. Just a few steps from the palace is one of the oldest Jewish communities in the world, which traces its history to nearly 2000 years ago. In 1948 the community numbered 2500 and today there are fewer than 30 people. The one Jewish family that remains is still centered round the original community and its crown Jewel, the Paradesi Synagogue. Built in 1568 and reconstructed after a Portuguese bombardment in 1662, the synagogue is distinguished by its tile roof and bell tower. The small synagogue is also known for its hand-painted, willow-patterned, blue and white Chinese floor tiles, and the many brass and crystal lamps that hang from the ceiling donated from all around the world. At night we headed back into town to watch a Kathakali dance presentation. This style of dance involves years of rigorous training to develop facial muscles and hand gestures that convey the various stories. The dancers have an uncanny ability to contort their faces into very many positions. The show started with an explanation of the dance culture and a demonstration of the expressions used. Then we were treated to an excerpt from a Hindu story about a Prince in heaven and an evil lady demon from hell who tries to seduce him (because of course it’s always the women who are bad pfft). During some festivals these dance presentations can last from 8 in the evening until 8 the next morning. It was truly amazing to watch this type of performance, we’ve never seen anything like it. Our flight into Mumbai showed us the contrast of city life that you can only see from the air. The outskirts of the city were extremely packed with tin-roof shacks. They are small, right next to each other, and sometimes a few stories tall. They stretch on for kilometers. Then almost as if by magic, the landscape transforms into high-rises and modern buildings, paved streets and green spaces. 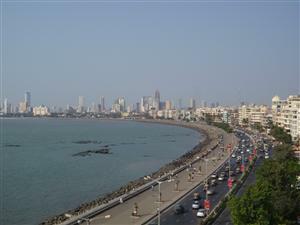 Mumbai is the country's financial and commercial hub and has a principal port on the Arabian Sea. There are many perceived opportunities for work so hundreds of thousands of people flock to the city in an attempt to improve their lives, often only to end up in the slums, which have earned Mumbai the title of the most densely populated city in the world. There are 18 million people living in Mumbai, and that is the official number, realistically it could be closer to 25 million. We spent our first day waiting for 2 hours in the lobby to check into our room at the hotel (we’ll spare you all the mind numbing details). We eventually gave up and wandered the city, doing a little grocery shopping and grabbing some lunch. We returned to the hotel and decided to spend the night in, purchasing the extremely expensive internet to upload our 1000+ photos and to unwind from the previous 10 days of travel in northern India. The next day we were picked up by our first female guide. We had a very good time with her, she was a no-nonsense type of person. She figured out pretty quickly that we didn’t want the typical tourist run-around. She customized the day and chopped it down into a half day excursion. 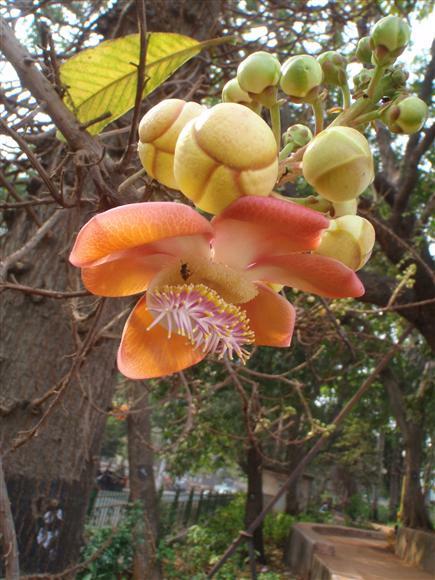 We started with the Hanging Gardens, also known as Pherozeshah Mehta Gardens. The gardens were built in 1880 over three reservoirs, which store 30 million gallons of water pumped here for cleaning before being supplied to the town. The reason the reservoirs had to be covered is that there was a Zoroastrian temple adjacent to the reservoir. This religion leaves their dead on the top of peaks, to be devoured by vultures and other birds, in order to allow them to be recycled back to nature. However, the potential of dropping rotting diseased flesh into the town water supply necessitated a solution and relocating the temple was not an option, so the reservoirs had to be covered. 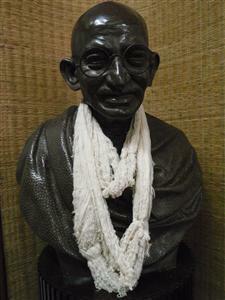 Next we went to a museum dedicated to Gandhi. It used to be his primary residence when he stayed in Mumbai, belonging to one of his dearest friends. It now houses an entire library dedicated to Mahatma Gandhi and similar thinkers on the first floor, portraits on the second floor and his old quarters and his life story on the third floor. We continued by car and saw the Gateway of India which is Mumbai's principal landmark. 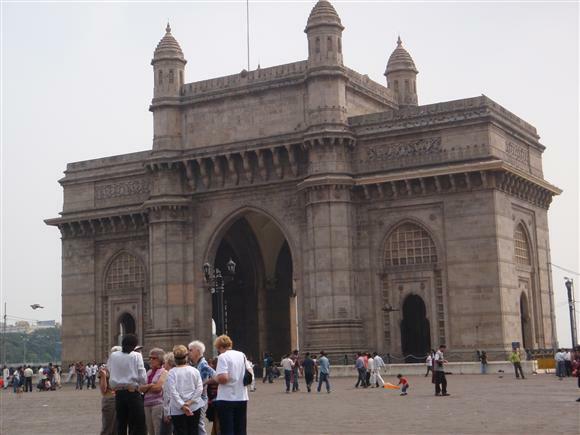 The Gateway of India is a huge archway on the water's edge at Apollo Bunder. It was built to commemorate the visit of the first ever British Monarch, King George V and Queen Mary in 1911. 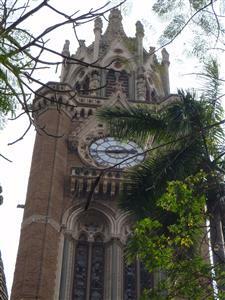 We continued on to the Rajabai Clock Tower at the Bombay University. Consisting of five elaborately decorated storeys, the tower is 280 feet in height. 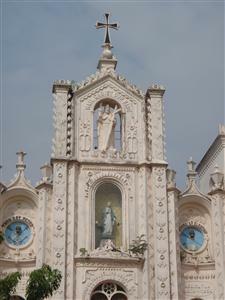 The top of the cupola is ornamented with sixteen statues depicting various Indian castes. We also drove by Chowpatty beach which is at the end of Marine Drive right by our hotel. It is the only beach in the central part of Mumbai. One can witnesses many Hindu religious ceremonies taking place at Chowpatty, like the Annual Thread-Tying Ceremony initiating young boys into the Brahmin caste, 'Nariel Purnima' towards the end of the monsoons and 'Ganesh Chaturthi' immersions. The one thing you can not do here is swim, the water is extremely polluted. But since Indian families don’t bathe in public they still spend plenty of days lounging on the beach just enjoying a picnic and playing games. Our last stop was the Victoria Terminus/Western Railway Station - one of Mumbai's most prominent buildings and architecturally one of the finest stations in the world. It is built in a style that combines Gothic and Indian influences. It was completed in 1885 and designed by F.W. Stevens. This Italian gothic Building has a frontage of over 15,000 feet. The administrative offices form three sides of a rectangle enclosing an ornamental garden, the entrance gate guarded by a massive stone Lion and Tiger. The most prominent feature of this building is the high 160 feet dome crowning the center. On top of the giant dome is a figure of a women with a torch held aloft to symbolize progress. Then we cruised around the downtown area of the city, visiting the univeristy, the clock tower, the gate of India, the hotels where the Mumbai terrorist attacks occured a few years back and a few other quaint spots within walking distance. We finished off our tour with lunch at Leopolds a well-known restaurant in the city, which is very close to the where the Mumbai terrorist attack happened in 2006. We got frisked and had to go through security to get into the restaurant. The food was good and we ate talking about how we, coming from a country that is so safe we have no comprehension of how much danger could be just around the corner in many countries all over the world. 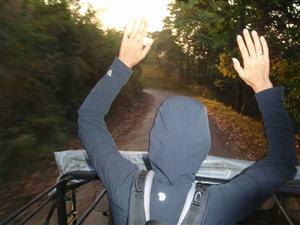 Travelling through India really shows you that safety should not to be taken too lightly. They check your bags coming into any hotel and you have to go through a metal detector. The police and army are clearly visible on the streets, which should give a sense of safety but in reality it does the opposite, it makes you realize that there is a reason there is so much security and such a police presence. In the time that we have been here we’ve heard about at least 6 terrorist attacks or foiled attacks, and that is in less than 2 weeks. 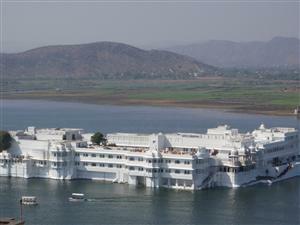 Udaipur... pretty white building in a lake, but great hunting lodge! The next morning we were up and on our way for the long 7 hour drive to Udaipur with the now common road-side stop for lunch. This place was the best of very few. 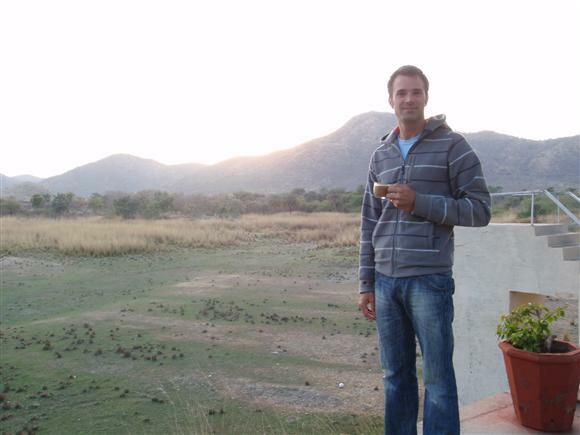 Not many tourists drive from Jaipur to Udaipur as it is much easier to fly. The food was strange and not that good, but when you are hungry just about anything will do and we didn’t get sick at all! We fed some of the stray puppies with our left overs, some of them are so adorable you want to play with them, but this is not such a good idea here. We made it into the city an hour and a half before sunset and pulled into our hotel at the Maharaja’s old hunting palace. This heritage hotel (Shikarbadi) was beautiful and tranquil. It is surrounded by the Maharaja’s horse stables, complete with many of his prized horses, his own private airport, a deer park, peacocks and lots of monkeys in the trees. After supper, while trying to feed one of the horses, we apparently disturbed a monkey who was sleeping in the tree above us. In retribution, he tried to pee on us from the top of the tree, but got out of the way before getting hit because we heard the rustling in the tree. The city of dawn, Udaipur, is surrounded by what were once azure lakes (Lake Pichola), hemmed in by the lush hills. Udaipur has a long history of being the inspiration for poets, painters and writers. It is also known as the jewel of MEWAR – a kingdom ruled by the Sisodia dynasty for 1200 Years who never succumbed to the Mughal or British rule. The modern Udaipur is a small (by Indian standards) city that has surprisingly clean, tiny winding streets in the city center. Early the next morning we visited the Jagdish Temple dedicated to the god Vishnu. The temple is situated in the middle of the city and was completed in 1651. It is a tribute alike to the tenacity of its builders and the resilience of the art tradition it represents. It attaches a two story hall to a double storied sanctum. The walls of the temple are covered with intricate carvings depicting the story of Vishnu and many parts of the Hindu Gita. After the temple, we went to the City Palace. Standing on the east bank of lake Pichola, is a massive series of palaces built at different times from 1559 A.D. The balconies of the palace provide panoramic views of "Jag Niwas" (the worldwide famous Lake Pichola palace hotel), Jag Mandir on one side and on the other the city of Udaipur. The palace is like many in Northern India, filled with many arches, series of courtyards, terraces, corridors and gardens. The Krishna vilas is a palace within the City Palace that was constructed in memory of a princess of striking beauty who poisoned herself to avert a bloody battle for her hand in marriage by two rival princes. The palace now contains many antique articles, paintings, decorative furniture and utensils. The Mewar rulers have been known throughout history for their contributions to charity and the downtrodden. At certain ceremonies the king would weigh himself on a giant scale and give away his weight in gold coins to the masses. Presently the Palace is still occupied by the royal family and much of it is cordoned off to the public, but they allow many artisans to take residence in the courtyards to sell their goods. Many tourists probably appreciate the convenient opportunity to shop, but we found it another overzealous attempt to get us to buy goods that we don’t need or want with a dose of guilt because you are kind of forced into sitting with the artist while they explain their trade with ’no obligation to buy’. However after the 5-10 minute demonstration and the sad puppy dog eyes, it is always with trepidation that we have to walk away without buying anything. We headed to the Saheliyon ki Bari, or 'garden of the maidens', which was built for the Queen and all of the kings concubines to entertain themselves, because they were always confined to smaller courtyards and kept hidden from any other males except the king. There are four pools and all around are flowerbeds, lawns, pools and fountains protected by a series of walls and shady trees. The garden has a lotus pool, a sitting room decorated with paintings and glass mosaics. However, the gardens now are a sad unmaintained version of some of the magnificent gardens of Asia and Europe. After a great lunch at on an outdoor patio we were rushed off to catch a cruise on Lake Pichola. The boat ride showed us a unique view of the lake city; hotel Jag Niwas, Oberoi Udaivilas (voted the #1 hotel in the world several times) and the Jag Mandir Palace a second island palace in the middle of the lake. 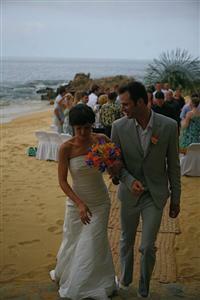 We got off the boat and wandered around the island which was being set up for a glamorous wedding that night. After the boat ride we went back to our hunting lodge retreat for a relaxing night, enjoying the tranquility. The next morning the staff even brought us breakfast to our room at 5:30 in the morning so that we could eat before heading to the airport. Jaipur ... the sound and light show is worth the drive! After an early breakfast we were on the road for a long day of driving and sight-seeing. 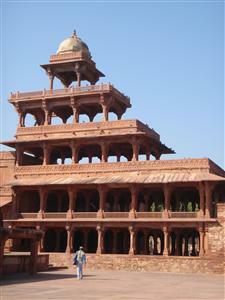 We first drove to Fatehpur Sikri, which is 37 km west of Agra. Jalal-ud-din-Muhammad Akbar, ‘Akbar’ was made the king at 14 and shortly after met the founder of the Chisti order of SUFIS. Akbar was blessed by the saint and in gratitude he ordered the great mosque of Fatehpur Sikrin to be built. Akbar transferred his capital here to Jaipur and built Jodhabai palace and many other buildings. He was a very forward thinking person and was tolerant of all religions. He had a Portuguese Christian wife, a Hindu wife and a Muslim wife. He encouraged an era of prosperity in the arts, learning and tolerance. 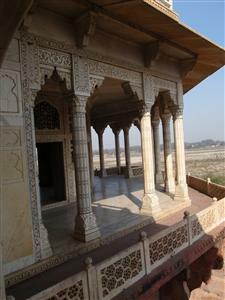 While we were touring Jodhabai’s palace we were again pleasantly surprised by the lack of other tourists. From Fatepur Sikri we drove to Abhaneri. We were on the highway for almost 4 hours and it was a driving experience. Our driver was very good and dodged everything in his path, cows, goats, and trucks coming at us head on…on a one way highway. Everyone drives like they are the only car on the road and also in the middle of the highway; there is no point of even having lines painted on the road because no one uses them. The scenery was constantly changing from mountains to sugar cane fields, to desert. The state of Rajasthan is beautiful. We stopped for lunch at a little resort that was just being built in Abhaneri. On the inside the restaurant looked like a little palace decorated in marble. 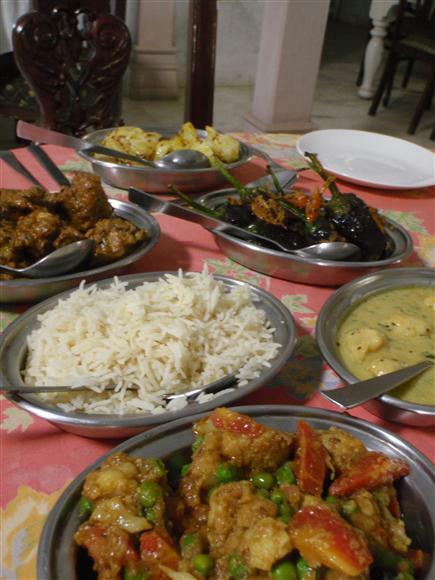 We were given 5 large silver bowls full of the local cuisine; stuffed small eggplants, potatoes sautéed with cumin seeds, chicken curry, vegetable curry, curds in sauce, naan bread and rice…what a feast! 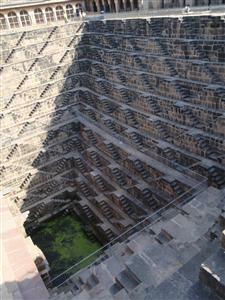 After lunch we went to see the Chand Baori, which is a 100 foot deep open well with flights of steps on three sides. This Baori is a marvel of architecture. There are two bathing areas with two royal toilets and carved windows, which were used by the then Kings & Queens. There are three tunnels which open about 20 Kms away from Chand Baori, which were used by the rulers as escape routes in case they were surrounded with their pants down (hahaa…). As we were walking around with the guide local kids were following us around just looking at us, we don’t think that there are many tourists that come out this way. After a quick visit of the Baori, we went 20 steps south to the Harshat Mata Temple. This temple dates back to the tenth century AD. All of the walls & surroundings around the Temple were of carved stone depicting the abodes of Gods & Goddesses Aradhnarishwar, Nag-Nagin, Prem Mudrakan, Natraj, Lord Vishnu & Budhas. It also shows a few scenes of kama sutra. 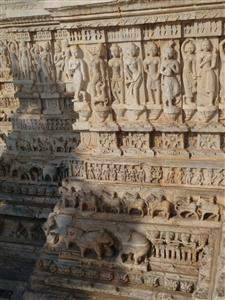 This Temple which was looted and destroyed by the Mughals is in ruins and pieces of sculpture are scattered all around. The Archaeological Survey of India is trying to restore the Temple. Of course we weren’t able to visit these two sites on our own. We were greeted immediately by an ‘official tourist guide’ for the area who repeatedly told us that he was the local expert. We weren’t charged anything for the visit, but there was the outstretched hand and rubbing fingers together ‘give me a tip’ gesture. Now, we don’t mind tipping but we really dislike the forced tour and services that all have the expectation of tips afterwards. Coming from a background of doing everything yourself, it is hard to adjust to having someone do everything for you, from opening doors, carrying your bags, dishing up your food, practically washing your hands for you, on and on it goes. We can understand that it helps to provide jobs for everyone and helps to give them a living wage, some situations just take some getting used to and some, stern brushing off in others. Jaipur is the capital of Rajasthan which was occupied by the Kshatriya warrior caste before they made alliances with the Mughal emperors and the later British invaders to enjoy a privileged position under their powers. Jaipur is also called “The Pink City” because the city was washed with pink paint in honor of a state visit by the British Prince Albert. Our hotel was located just outside of the old part of the city. A quick turn off of one of the small cluttered local roads lead to a courtyard with a beautiful heritage hotel. We loved the little hotel, and the food at the restaurant. We did run into some problems with our internet (boo hoo us) and no hot water. The real problem with the internet wasn’t accessibility it was the horrible service from the reception. The next day was packed with sightseeing. We visited the Amber Fort Palace, the City Palace, Hawa Mahal and Janta Matar. Our guide picked us up at the hotel and we quickly visited the Hawa Mahal. The ornamental facade of this "Palace of Winds" is a prominent landmark in Jaipur. It’s a five story structure of pink sandstone encrusted with fine trelliswork and elaborate balconies. The palace has 953 niches and windows. Built in 1799 by Pratap Singh, the Mahal was a royal grandstand for the palace women. All of the windows have screens on them as most of the buildings in these areas which are there so that the women can see out of the buildings but no one can see the women inside. Women were kept away from any males, they were only allowed to be seen by their husbands and sons and even their sons were sent to live with their fathers once they reached close to puberty age. The royal women were guarded by Eunuchs who posed no threat (they were castrated at puberty), no male guards were allowed near them. 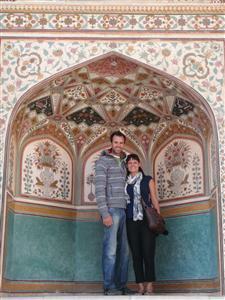 We continued on our way to the Amber Fort Palace which is the main attraction of Jaipur. Amber is the classic romantic Rajasthani fort palace. Its construction was started by Man Singh I in 1592, and completed by his descendent Jai Singh I. We got in line with all the other tourists to take an Elephant ride all the way up the fort. It was a 20 min wait to get our Elephant and we spent it ignoring vendors trying to sell us Turbans (which was a little odd) and cheap pens, the best part was that for a turban they wanted 20 US dollars and 10 dollars for the pens, both of which probably took less than one dollar to make. No, sorry, THE best part was that some tourists were actually buying them! 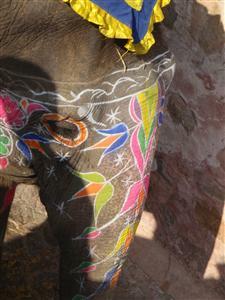 As we got closer to the elephants we saw that all of them were elaborately painted in bright colors, but they all looked sad. It looked like hard work walking up and down the fort carrying tourists on their backs. 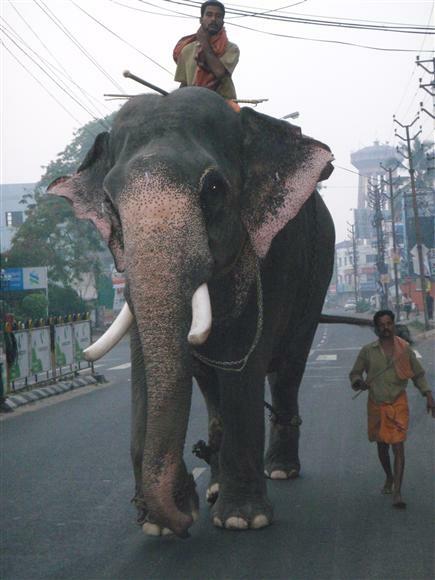 We noticed as well that almost all of the elephant masters who were steering the elephants while sitting on their necks were also hitting them with either a short wooden club or a metal hook like tool, it was not pleasant. The sort of tourist attractions always seem like a good idea but in the end always make us wish we would have not participated. The only reason those elephants are there is that dumb people like us agree to take a ride on them for money. At the end of the 15 min ride up the fort the elephant driver asked us in bad English for a tip, give tip, give tip. There were signs all over the place saying not to tip the elephant drivers. So we said no…he then asked us what country we were from and we told him to which he said many many times: Canada not good country. He then made us wait as several other elephants passed us, cued and had their riders get off. He told us ‘this is your tip’, at which we laughed and told him we don’t mind waiting all day. Oh well, can’t win em all. The Amber palace is huge and inside you can see that it is a beautiful fusion of Mughal and Hindu styles in architecture. Next we went to the City Palace which is a delightful blend of Mughal and traditional Rajasthani architecture, it sprawls over one-seventh of the area in the walled city. It houses the Chandra Mahal, Shri Govind Dev Temple and the City Palace Museum. In the City Palace museum we saw many of the dresses and preserved textiles, they were all very detailed and some even woven with gold and silver. One of the rulers was 7 feet tall and 510 lbs! One of his outfits literally is as big as a small tent! Our last stop was the most interesting called Jantar Mantar, it is the largest and best preserved of five astral observatories built by Jai Singh II. It consists of huge astronomical instruments that are still in use. There were giant sun dials and other instruments with which you could calculate solstices the sunrise/set and the movement of constellations. 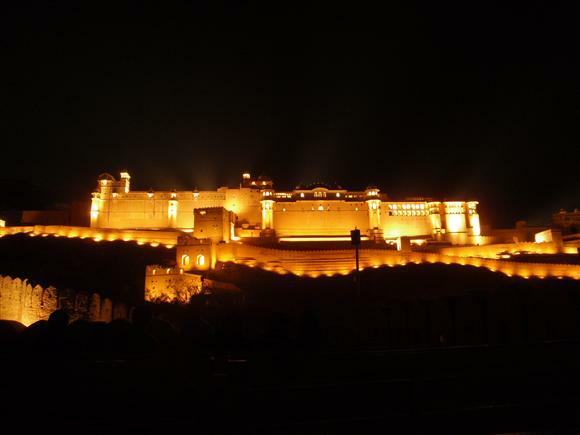 That night we traveled back to the Amber fort for a ‘sound and light’ show. We weren’t sure what to expect but we were ‘mind-blasted’ (thanks Russell Peters) by the show. There were only about 40 other tourists watching as the entire palace was lit up in a multicolored array timed to music and narration of the history of Jaipur. The sound quality was surprisingly excellent and in stereo, which along with the intricate lighting made all of the stories in the narration come to life. We were both a little worried about our 2nd class train journey on the Indian train, but we shouldn’t have been! Not after travelling on the train all throughout Europe, Russia and China….nothing will beat the 13 hour Vietnamese train from hell. This was not bad, even the bathrooms were bearable, which is hard to say about other trains around the world. 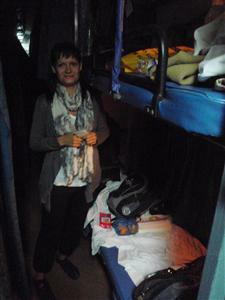 The second class wagon has AC and is quite comfortable as far as sleeping wagons go, we even had some sleep that night! The train was only an hour and a half late so we got to sleep in the next morning until 05:45! We were lucky because right across from us were a couple of Japanese girls with their tour guide who spoke English who let us know when to get off the train since there are no announcements where the train was stopping so either you know or you don’t. We also met a random Indian man who like all the other Indian men in India have an opinion about everything and are also always correct (even though this one got Canada mixed up with Australia and thought that 80 yen would pay for a tour of India). We also met a few urologists who were travelling to a conference. We got into Agra at 7 in the morning and we waited by our wagon for our guide to pick us up…they specifically said “DO NOT LEAVE THE TRAIN STATION”, we can just imagine past travellers leaving the station wandering the streets of Agra looking for their guide. He was there right away and took us to the Trident Hotel which was a beautiful new hotel. We were also greeted by the same friendly driver we had in Delhi, Mr. Kandu. We had just enough time to freshen up and have a gourmet breakfast with the most amazing coffee we’ve had so far in India, and then we were off to THE sight…if the only sight to see in India…the TAJ MAHAL. Our guide and driver picked us up from the hotel and drove us most of the way and then we took a Tonga ride which is a small carriage pulled by a horse up to the gates of the Taj. 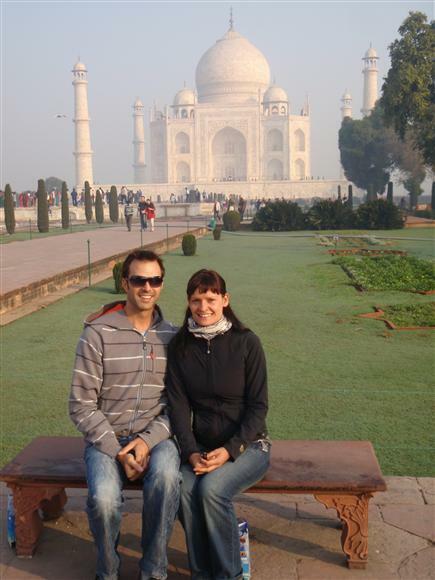 One of the reasons we took the Tonga ride is that no cars are allowed within a kilometer of the Taj Mahal. The Indian government even closed all of the factories within the city and surroundings so that this very popular tourist site would not be covered in smog and pollution. All the people in this area now rely on tourism and cottage factory manufacturing instead of industry to feed their families. Little needs to be said about the Taj Mahal: this architectural wonder which is always the sole reason for every tourist's visit to Agra. Built by Shah Jahan, the Taj is a white marble memorial to his beautiful wife Mumtaz Mahal. It took 22 years to be completed and was designed and planned by Persian architect Ustad Isa. Apart from its stunning design balance and perfect symmetry, the Taj is also noted particularly for its elegant domes, intricately carved screens and some of the best inlay work ever seen. It is said that Shah Jahan had plans to complete a symmetrical building in black marble on the other side of the river as a mausoleum for himself. 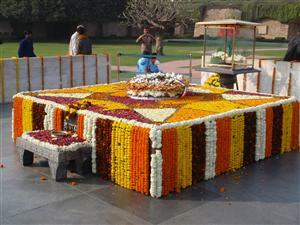 He was overthrown by his son and held prisoner in the Agra fort for the last years of his life. The existing Taj is amazing and it is truly inspiring to imagine what it would have looked like with its mirror image in black across the river. It is so peaceful to walk around the Taj Mahal, we were lucky that there weren’t so many visitors at the time we were there, it was quiet and really let us take it all in. Of course we had a ‘local guide’ take our camera from us to help us take the ‘obligatory’ tourist photos. After the Taj Mahal, we headed across the river to the ‘Baby Taj’ built by the father of Shah Jahan. This monument is further away from the touristy areas and is difficult to reach without your own car. When we arrived there was only one other tourist couple visiting and several local couples lounging on the grassy area around the mausoleum. 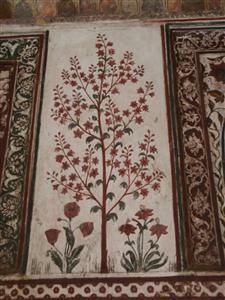 The baby Taj has beautiful inlay work in the marble, much more detailed colorful and intricate than in the Taj Mahal. The grounds are a peaceful break from the other tourists and hawkers and we spent a short while relaxing on one of the benches in the compound. After a quick lunch we were off to the Agra Fort, which was built by the famed Mughal emperor Akbar in 1565 AD, the fort is predominantly made of red sandstone. Ensconced within is the picture perfect Pearl Mosque, which is apparently a major tourist attraction. However our guide told us that as non-Muslims we wouldn’t be able to enter. We think that he simply wanted the day to be over quicker and told us this to cut the tour short. 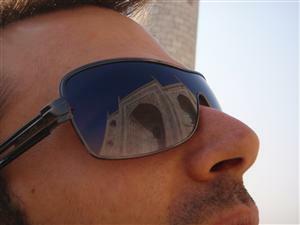 The fort lies on the bend of the river Yamuna, almost in the heart of the town and overlooks the Taj Mahal. It was in this fort that Shah Jahan was imprisoned to look across the river at the Taj Mahal until his death. The fort is still in use by the Indian Army and nearly 70% of the area has restricted access. When we came back to the hotel after our day of sightseeing we were surprised to find our room to be very chilly. Apparently we left the AC on when we left and now, as the temperature was dropping with nightfall, our room was only 19 degrees. We tried to use the thermostat on the wall, but found out that it is only for AC, not heat. Looking through the amenities guide for the hotel, we found that you can call room service for a space heater! We were all over that and within a short time we had a toasty little oven in our room to keep us warm through the night. Who would have ever thought you’d need a heater like that in India! “Picturesquely situated on the crescent shaped left bank of the holy River Ganges, Varanasi, is one of the ancient seats of learning in India. It is said to be a compound of the names of two streams, the Varuna and the Assi, which still flow into the Ganges from the north and south of the city respectively. 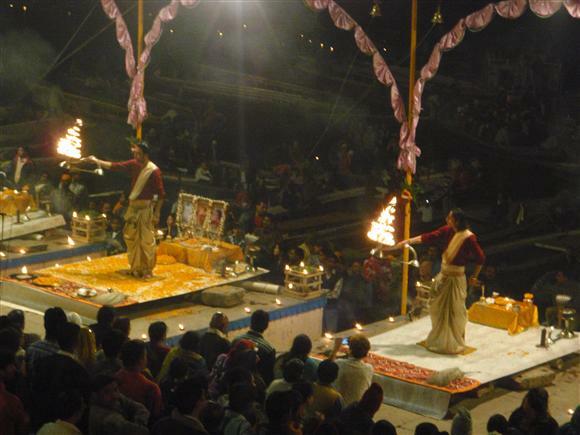 Varanasi is probably one of the most ancient living cities in India. From time immemorial it has been a great religious center for Hindus and one of their most sacred places of pilgrimage, being visited by millions of people every year. 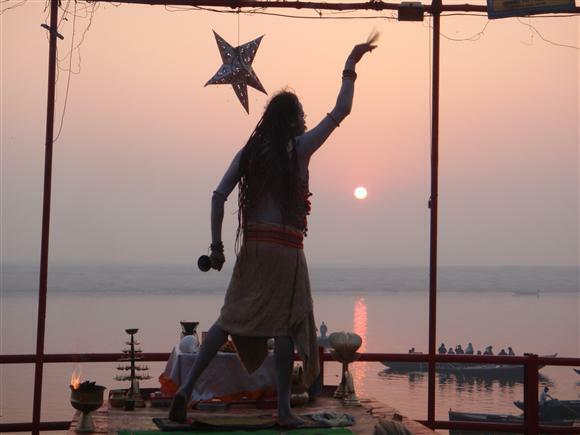 To every visitor Varanasi offers a breathtaking experience. The rays of the dawn shimmering across the Ganges; the high-banks; the temples and shrines along the banks bathed in a golden hue …soul stirring hymns and mantras along with the fragrance of incense (and smoke) filling the air…and the refreshing dip in the holy waters gently splashing at the Ghats. Baths in the Ganges are suggested for locals only! Varanasi abounds in the art of silk weaving, an exotic work of art which manifests itself in silk saris and silk brocades which are cherished as collector’s items across the world today. “ To sum it up…an amazing place to experience. The security at the airport in Delhi (in India generally) is much more strict. You are checked before you even enter the airport and multiple times on the way to the plane. There is a final check just before boarding of your carry on baggage. Our flight to Varanasi was filled with tourists. There were probably only 10 or so Indian people onboard. Arriving in Varanasi, we got a taste of what an ‘authentic’ Indian transportation hub might be like. There was very little security and the terminal is common for departures and arrivals, with nothing more than one counter, a few bathrooms and a luggage belt that is only 20’ long. It was frustrating and funny to watch people scramble to get their luggage from the belt before it landed on the floor in the mountain of luggage piling up at the end of the short belt. It really seemed like all the tourists were scared someone was going to run away with their luggage. After being met by our guide and driver we dropped off our luggage at the Hotel Hindustan International. The hotel was dated to say the least. We were a little surprised by the dirty sheets and blood stained wall (from squished mosquitoes it looked like). We were alright with the hotel, it was the one recommended by all of the Indian travel companies that we received quotes from. Varanasi is one of the most unique and amazing places we have seen, and you have to take the good along with the bad. A few minutes later we were on our way. Our first stop was the Bharat Mata Temple (Mother India), built in the early 1900’s. The temple features a big relief map of India and surrounding countries engraved in marble. The map is to scale and is nearly 100% accurate to the best maps of that day. Our next stop was the 18th century Durga Temple, commonly known as the Monkey Temple due to the huge population of the monkeys. In recent years the monkeys have been pushed out of the area by the local people. 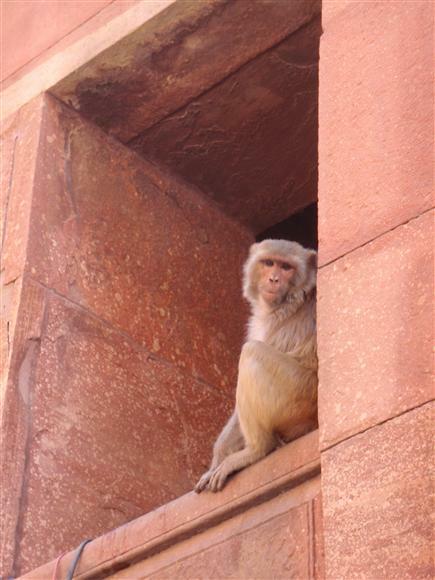 The monkeys have found a much better life in the rooftops of the town rather than in the temple. Now instead of scavenging for scraps, they sneak into people’s homes and steal food straight out of their cupboards and refrigerators. The Durga temple was previously closed to non-Hindu’s however the priests of the temple have opened it up for foreigners, as long as a donation is made. This was our first chance to get a Tikka, or a Hindu good luck blessing (red or colored dot on the forehead between your eyes). 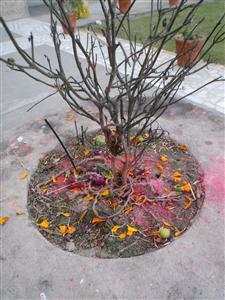 However, as Non-Hindu’s we abstained from this blessing because we felt doing it wouldn’t be right. It’s a bit weird to see tourists walking around with Tikkas on their foreheads and at some attractions even with turbans on; we don’t quite get it and therefore don’t partake. We drove through the BHU University campus, which is considered the biggest residential university in Asia. There are over 36,000 students living on the university grounds. The grounds are huge and also extremely clean compared to the real world outside of the University gates. Inside of the university we visited the Mosque of Mughal Emperor Aurangzeb, where we were again unable to take photographs. The end of our night was a trip down to Daswamedh Ghat. This is one of the main religious areas on the Ganges, where people make pilgrimages and are blessed by the local priests who sit along the banks of the river. In the evening, a special show is performed (admittedly for tourists our guide said). 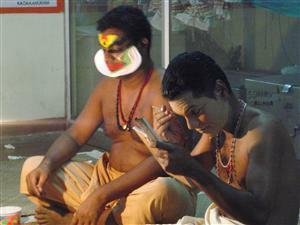 The show consists of ceremonious chants, rhythmic movements with fire and incense. The normal religious ceremony that this show mimics is supposed to be very plain. The next morning we were up early to head back to the Daswamedh Ghat for a morning river cruise of the Ganges. We were glad that we bought new sweaters and jackets for this leg of our trip. The temperature at 06:00 when we left the hotel was only 13-15 degrees and there was a strong breeze blowing over the water. The sight is simply majestic. You are truly in another world here. 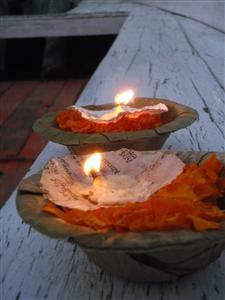 We saw the cremation Ghats and witnessed the living traditions of one of the world's oldest religions. Thousands of faithful come daily to the banks to bathe and pray while in the background, temples and palaces rise in tiers from the water's edge. After the boat ride we walked through tiny winding cobblestone streets along the banks of The Ganges. The shops were just opening, and the place now turned into a beehive of activity as the faithful are coming and going. A few hundred meters from the Ganges is the Kashi Vishwanath Temple. 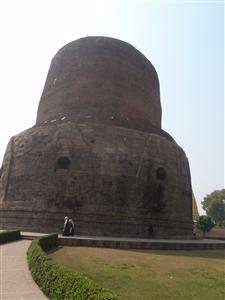 This site is disputed between the Hindus and Muslims as there is a Hindu temple and a mosque built upon the ruins of an ancient Hindu temple. 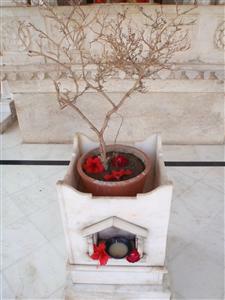 This site is one of the 3 most holy sites in India that is disputed between Hindus and Muslims. Due to terrorist activities at one of these sites the security for a large area around this site is strongly protected with many guards. We entered the restricted area and had to give up all potentially dangerous goods (anything electronic, all bags, any liquids, even pens). Then we had to go through metal detectors (which are common everywhere) and a physical search (males get searched by males and females only by females). Once inside there were guards stationed every 15-20 meters. The experience was topped off with not even being able to go into the temple or the mosque. However, our guide knew someone inside who sold essential oils, funny how that works. We bought some oils because the prices were much lower than what we would have paid in Canada. We still think we were ripped off, hahaa. We were off to the railway station to for our train to Agra. We were told that we were lucky, the train was only 1.25 hours late, the same train had been consistently 10-14 hours late in the past weeks! From the Sydney airport we flew with Emirates airlines to Bangkok for an overnight stay before making the final leg of the journey to Delhi. We’ve decided that Emirates is our new favourite airline. The service is great, there is tons of leg room and the entertainment is amazing. Very many movies, tv shows, music and games to choose from. 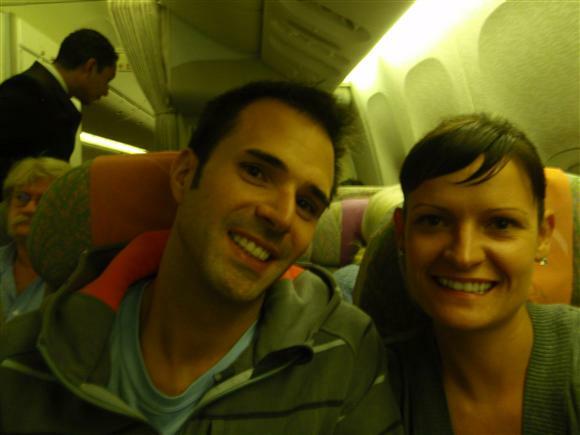 The 9 hour flight melted away and we were in Bangkok before we knew it. Our quick layover in Bangkok was just long enough to remind us of how much we enjoyed Thailand. The people and the culture is so warm and welcoming. The air has a particular scent and the food is great! We both agreed that Thailand is a country that we will definitely visit in the future. The one thing we forgot about was the departure tax of $25 US per person, which must be paid in cash. It’s really one more chance to rip off foreigners one last time before the lave the country, especially if you only have a lay-over and don’t have any Thai Baht handy. We started the trip to India with a quick introduction to Indian culture. We went to the gate to check in for our flight and were bombarded with a rush of 20+ Indian men raging to check in and get their goods on the plane. All of the passengers were men and they apparently came to Bangkok to buy big screen TV’s, remote controlled helicopters and other similar toys. As we tried to stay in line, we were elbowed and bowled over by trolleys. It took us about 5 seconds to figure out that there really was no line at all. All of the men were checking-in in groups, so if one person was ahead of us in line, it turned out to be really 8 people, it was extremely frustrating. Luckily the Bangkok ground agent saw Ewas frustration and ushered her to a separate check in counter. The flight had the most demanding passengers we have ever seen. The sound of the attendant call button being pushed was non stop. Everyone on the plane wanted something and they wanted it NOW. For example, there was a man already seated and he simply took off his jacket and held it into the aisle. When the attendant came close he looked at her, said thank-you and forced the jacket into her hands, expecting without question, please or thank-you to deal with the jacket. When we landed in Delhi we were greeted by our Compass (our tour company) representative who was waiting for us along with our driver. He told us that Delhi had their Independence Day on January 26th; we were 3 days late to make it 6/6 with all of the other national holidays we’ve hit in other countries (China, Vietnam, Cambodia, Thailand, Australia). It was already after 10pm and we went straight to the hotel making a stop at an ATM. We are normally cautious and careful at ATM’s, but this time we were more nervous than usual. Our guide and driver both escorted us to the ATM, which was also guarded by two security officers with guns. We’ve since learned that this is not normal for other ATM’s, but it was an intimidating beginning to the trip. The hotel we checked into was decked out in marble and had one of the most comfortable beds we have stayed in since Singapore. Going to sleep that night we were thinking that this leg of the trip was going to be a strange blend of poverty outside our hotel doors and the comfort we would enjoy each evening. The next morning we were up early for the buffet breakfast, which was an amazing spread of American and Indian food and drinks before meeting our guide for the day. We started in New Delhi, which reflects the legacy the British left behind and marks a division between New and Old Delhi, between the capitals of the British and the Mughals. We first visited the Qutub Minar, the tallest stone tower in India. Construction commenced in 1193 under the orders of India's first Muslim ruler Qutb-ud-din Aibak. The topmost story of the minaret was completed in 1386 by Firuz Shah Tughluq. 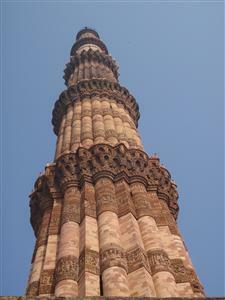 The Qutb Minar is notable for being one of the earliest and most prominent examples of Indo-Islamic architecture. It is surrounded by several other ancient and medieval structures and ruins, collectively known as Qutb complex. Next, we drove past the imposing India Gate, the Parliament building and the Rastrapathi Bhawan, the President’s residence. The parliament buildings are a monumental structure built by the British and now occupied by the Indian government. Security is tight and we were not allowed to enter. 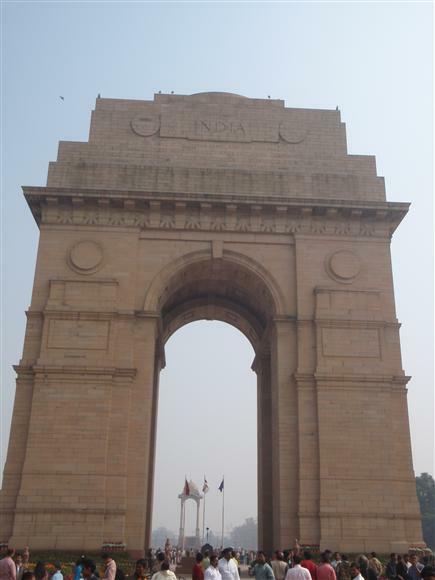 The India gate is the Indian version of the Arc d’triumph in France. Only, just like the parliament buildings, the gate was built by the British. It is inscribed with the names of 90,000 soldiers who died in the war of the British Indian Army and lost their lives fighting for the British Indian Empire, or more correctly the British Empire in India British Raj in World War I and the Afghan Wars. Our guide then strayed from our planned itinerary and took us to a Hindu temple the Birla temple. The temple was our first Hindu temple and we saw that it shares many of the same traditions and beliefs with the Buddhist temples we visited in Asia. The Hindu’s actually say that the Buddha was the 9th incarnation of Lord Vishnu. In all Mosques and Hindu temples your shoes must be removed and often your socks as well, to show respect. We weren’t allowed to photograph inside the temple, and we will have to rely on our memories for all of the intricate temples, ornamentation and carvings. We stopped for lunch at what was to be our first of many ‘tourist’ Indian restaurants. The front door is armed by guards and inside there were many servers and no locals. The meal was great, but at the end, our waiter tried to enforce an ‘extra service charge’. Ewa, using her now fully matured and keen backpacker senses saw through the scam and told the waiter that if it is a required charge as he was implying, to put the charge on our bill. After a minute or so of arguing, our guide came to check on us. A few curt exchanges between our guide and the server in Hindi, and we were on our way without paying the added charge. We visited the Raj Ghat, where Muhammed Ghandi was cremated and then we drove into old Delhi for a rickshaw ride through the small streets of the market. Our guide told us that we would have to tip the rickshaw driver at the end of the ride. Chad gave him 100 rupees, but the driver was forceful enough to demand that this was not enough, and unwittingly Chad gave in and tipped 100 more, which was probably in the end about 150 rupees too much as the driver had already been paid for the trip by our guide. 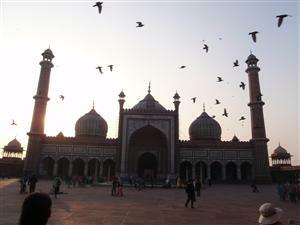 At the end of the Rickshaw ride we stopped at the Jama Masjid, one of India’s largest Mosques. Normally tourists, or any non-Muslims are not allowed to enter, however we arrived a few minutes after one of the prayer sessions and were allowed to go in, for a small charge of course. Our first visit to a mosque was surreal. Although the large dome and courtyard were nearly empty when we visited, the idea of thousands of devotees praying in the square was inspiring. The Mosque has been in constant use since its construction in the early 1600’s. Outside the mosque is a huge ‘soup kitchen’. The mosque provides meals for free to thousands of people every day. They have a space ~80’ x 80’ which they fill with people, sitting cross legged on the floor. Each person is provided a meal of soup, or lentils with naan bread. Once the meal is done, they clear the space, clean it and prepare another meal to be immediately served again. When we were there, hundreds of people of all religions were waiting to get their free meal. That night we relaxed in the hotel chatting about our Indian experience over a bottle of Australian Duty-free wine and headed to bed. On our way to breakfast, we could see from our 5th story window the locals just outside of the gate of our hotel, sitting around a small fire cooking their breakfast. It certainly puts perspective into your life as you are eating your gourmet buffet, knowing how people are living only 100 meters away. After breakfast we were off early on our flight to Varanasi, one of the oldest and most spiritual cities in India. Airlie ... WTF, why didn't anyone say that you can't swim in the ocean here?!? Welcome to the Whitsundays. Land of beautiful white sandy beaches and turquoise waters… which you can’t swim in. The waters here are filled with jellyfish, including Irukandji and box both of whose stings can be fatal. So, in order to go swimming in the ocean, you need to wear a ‘stinger suit’. They are usually a 3mm wet suit, or sometimes a thinner lycra version. They are supposed to limit the surface area exposed to potential stings. However, your feet, hands and neck/head are still exposed. We didn’t rent a suit so we couldn’t even swim in the ocean. The great thing about the city is that they built a huge lagoon a few feet from the ocean to serve as the local swimming hole. The lagoon is nearly the ideal swimming pool, it’s surrounded by palm trees, green space with sand and there is a separate kid’s pool too! There are showers, toilets, water fountains and plenty of little shops to eat at; everything that you need to stay for the whole afternoon. The only downside is that the pool is only about 5’10” deep at the maximum and with the high temperatures and strong sunlight it gets to body temperature or even warmer. It’s not really a great place for cooling off. We couldn’t get onto our sail ship for a few days because the first sailings were booked. Instead of spending the extra days around Sydney, we thought that we could spend them diving on the Great Barrier Reef (GBR) and swimming in the ocean. As it turns out, there are no day trips from Airlie to the GBR. The town is set up great for sailing but not diving. To do a diving here you have to do a live a board. We were disappointed the travel agent didn’t tell us these things before we came, and if we knew, we would have made other plans. We checked into our hostel, the ‘Backpackers by the bay’ which is a dirty little mini-motel. The staff was fun and hosted trivia night and they showed movies at night until the screen broke (like many of the things at the hostel). We spent the next 5-6 days wandering around town, hanging out at the lagoon and using the internet to plan the next parts of our trip and our return home. Ewa managed to get thrown out of a coffee shop for spending nearly 1.5 hours there and having only purchased two coffees while using their ‘free wifi’. The barista was very rude and insisted that she buy a meal in order to stay in the café and at $14+ for even a sandwich that wasn’t going to happen. Other than that, nothing remotely exciting happened. The day before we sailed, we changed hotels because the tour operator provided accommodation the night before and after the sailing. The ‘Wander’s Resort’ wasn’t any better than the Backpackers we had just left behind. At night we even had to defend ourselves against several small spiders (potentially life threateningly poisonous in Chad’s paranoid mind) and one huge, nearly fist sized spider. We spent 10 minutes trying to kill the large spider with the toilet scrub brush, but the spider was too quick and we were too scared to get too close. We eventually managed to kill it by throwing a towel over the spider to trap it and then smashing all over the towel just to make sure we got it! 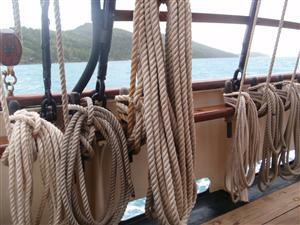 The next evening we boarded the Solway Lass, a 109 year old tall ship. Neither of us had ever been on a tall ship before and we were excited. There were about 25 guests and 6 crew members on the 2 day/2 night trip. 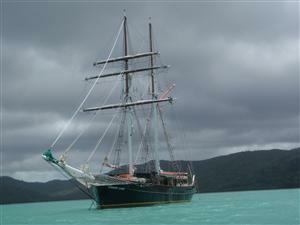 We departed for the Whitsundays area that evening. The weather wasn’t very good and the forecast for the remainder of the trip wasn’t any good either which seems to be a trend with our “water excursions” (Hurricanes in Vietnam/ Storms in Thailand). Apparently a cyclone was headed towards us and we were expecting 30 knot winds. So that evening since we were rained out from the deck we went to bed early hoping for at least some sunshine the next day. A lot of people were sea sick the night before and most of the first day on the open sea. We had a few nauseating moments but for the most part we were ok, staying on the deck where there was fresh air and a horizon. 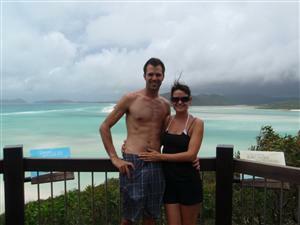 We visited Whitehaven beach which was the whitest and most beautiful beach we have ever seen. The sand is extremely fine and soft and sticks to your skin like it’s holding on for dear life. We got to take some amazing pictures from a view point area above the beach of the moving sands against the turquoise water, it was amazing. The guides told us that they frequently see huge Manta rays gliding through the shallow waters! Chad didn’t feel like swimming but Ewa got on her suit and spent a good half an hour jumping waves and enjoying the water. After the swim we made our way back to the group to relax under the shade of a tree until it was time to head back to the boat. Not many people accounted for the harshness of the sun’s rays, combined with the reflection off the water and the white sand – there were a lot of sunburned body parts. We got sunburned but were quite lucky that it wasn’t as bad as some other people, one guy from Sweden burned his face so bad that his forehead was blistering and oozing puss the next day! Yikes. Australia definitely has the harshest sun in the world. The rest of the day we relaxed had great food that the on board chef prepared fresh and enjoyed a few beers provided by the ships wench. Yup, they actually called her a wench, all in good fun! In the evening the boys put on their stinger suits and jumped from the ships swing rope to cool off, Chad even climbed the rope to jump off and jumped off the front of the ship. The weather seemed to be getting better and we spent the evening on the deck talking to the other guests. Our last day and night on the ship was going to be fun, it was Chads birthday! When we were still in Airlie, Ewa went to the company to make sure that Chad would have a cake on his birthday; it’s not every day that you turn 30! During the day we went to explore one of the reefs along the islands that were in the area. We went snorkelling and also went for one dive. We were looking forward to diving the Great Barrier Reef for a long time and since we couldn’t get too far out, this was going to have to do. 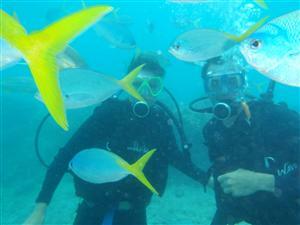 We were still on the reef and happy that we could do even one dive. The snorkelling was great too, it was very amazing to see the amount and variation of fish life and the coral was beautiful. Our dive went smoothly, it was a bit murky because of the weather. We even took our camera diving since the max depth we would be going to would be 14m. We took lots of pictures and even two videos. After we had dinner, the captain announced that someone would get whipped! 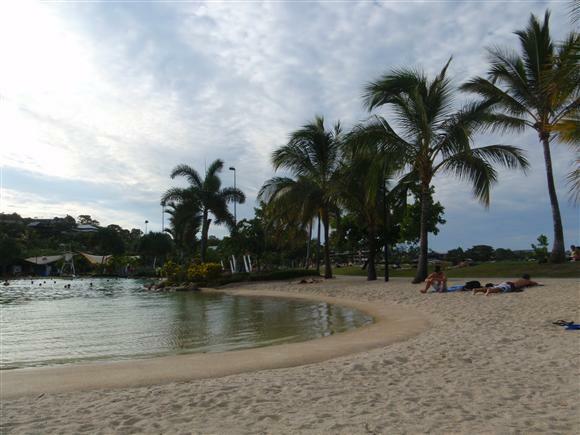 On our first day, he had explained that if anyone disobeyed the marine park rules that they would get flogged, some of the offences are no big deal like for example bringing sand onto the boat, that can get cleaned up – some big offences are taking shells or coral from the beaches (along with flogging it is a $3000.00 Aus dollar park fine). Ewa wasn’t sure if Chad had yet caught on that it was him, but only because it was his birthday! The crew gave him some beats and even gave Ewa the whip to hit Chad too (unfortunately she actually hit him on his burn) and then the chef came out with a cake for Chad lit with candles and everything! The entire boat sang Happy Birthday to him! And to top it off, they served the cake with ice cream. 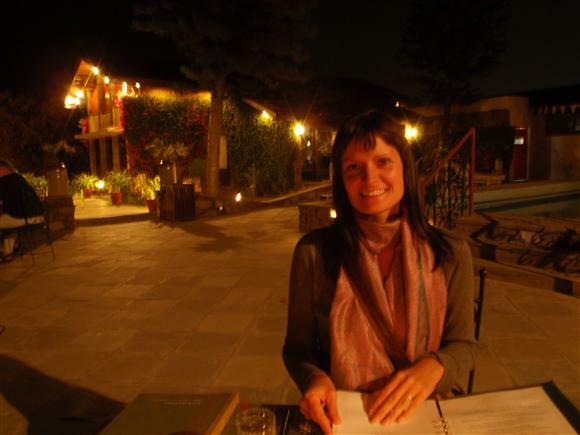 We stayed up that night chatting with other guests and getting travel advice on India from other backpackers. On the last day of the sailing trip we slept in until 8:30 and spent the morning on an island jungle trek and hung out on a beach. It was sad to know we had to get off the boat that day and would be leaving Australia soon. We spent our last night in Airlie beach at the spider resort again and the next day flew back to Sydney. We got in pretty late and headed straight to our fav restaurant Spice I am for a quick bite before heading off to bed, Ewa was surprised Chad could even sleep because the next day the only thing on the itinerary was to see Avatar on the largest IMAX screen in the world! We spent the morning enjoying coffee and walking to the IMAX picking up last minute supplies for India along the way. We had a nice picnic on the harbour before the movie and then spent 3 hours in front of an 8 storey screen watching Avatar in 3D. What an awesome flick. We headed back to the hotel and caught the train to the airport where we were catching our first Emirate airlines flight to Bangkok on our way to India.